I feel like the incredible shrinking woman lately. I'm losing all my baby weight fairly quickly. I wasn't able to get the breastfeeding boost. It's all due to diet and exercise. One of the things I have been missing is pasta. So, when I came across the idea of zucchini pasta I jumped on it. 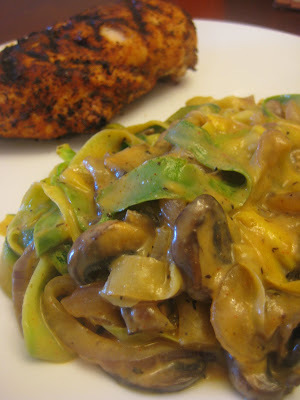 My husband had been repeatedly requesting to have Cajun Chicken Pasta. I kept turning him down because I couldn't afford to eat the calories in the sauce AND the pasta! So, I made my zucchini pastas and made a dish out of that instead. Delicious! It totally fulfilled my craving for "pasta" and didn't scream zucchini either. I bet if you mastered the art of shaving off the "noodles" you could trick kids into eating a green veggie. 1. Use a vegetable peeler to shave off strips/noodles of zucchini. Peel down the zucchini until you get to the core (that's the part with the seeds). Discard the core. 2. Saute the "noodles" in a little olive oil over medium-high heat for a few minutes until they begin to get translucent. 3. Serve with whatever sauce you'd like. Wow, that is amazing. Never thought of it but I can see how it would work. I will have to try it sometime.